In this Art Museum Encounter podcast, award winning glass sculptor Steve Maslach engages in a fascinating and insightful conversation with Bainbridge Island Museum of Art Curator and Executive Director Greg Robinson. From this conversation, we learn about Steve’s artistic progression from an award-winning blown glass designer managing a sizable studio with many glass artists in California, to a molten glass sculptor creating very large unique works at his solo studio in the woods on Bainbridge Island. 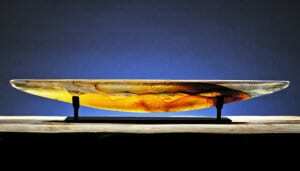 Last Ice Aurora by Steven Maslach (cast glass, steel, and color filters). Click on image to enlarge. 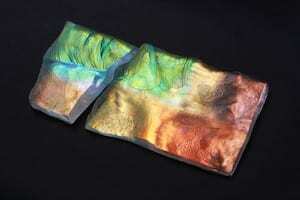 Steve talks about the unusual process by which he lets light and color into his thick molten glass sculptures. And he talks about his journey of discovery as he works directly with molten glass, which, he believes, is like performance art. 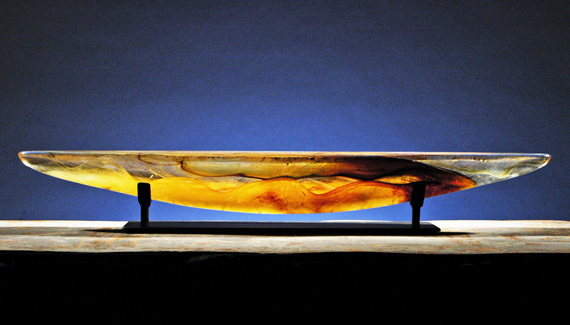 His focus on working with the molten glass enables the artist to engage in the creation of the sculpture, requiring countless physical decisions to be made moment by moment with the fluid glass. 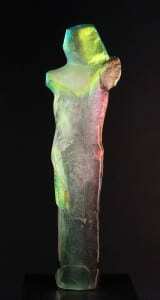 Menhir Green Head by Steven Maslach (cast glass, steel, and color filters). 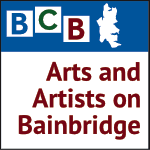 This podcast is an episode of BCB’s recurring podcast show called Arts and Artists on Bainbridge. It is part of a series of “Art Museum Encounters” in which BIMA’s curator talks with artists and collectors whose works are currently on display at BIMA.